The TOEIC® Test can be used to test current and prospective employees either at your Organisation, or at locations across Australia and New Zealand through Public Testing. •Boost levels of morale and enhance team interaction. The TOEIC Test sets the standard for English language assessment worldwide. More than 5000 organisations around the world use the TOEIC Test to set the standard and gauge the workplace English skills of over 4.5 million current and prospective employees. 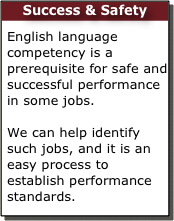 The TOEIC Test reflects authentic real-world tasks with a business orientation. Find out more about testing your employees.